Rotary’s youth leadership programs develop the next generation of leaders, provide funding to make the world a better place, and make peace a priority. The programs are not just for club members. Most of them are of little or no cost to the participants. Here is what to expect from these programs. 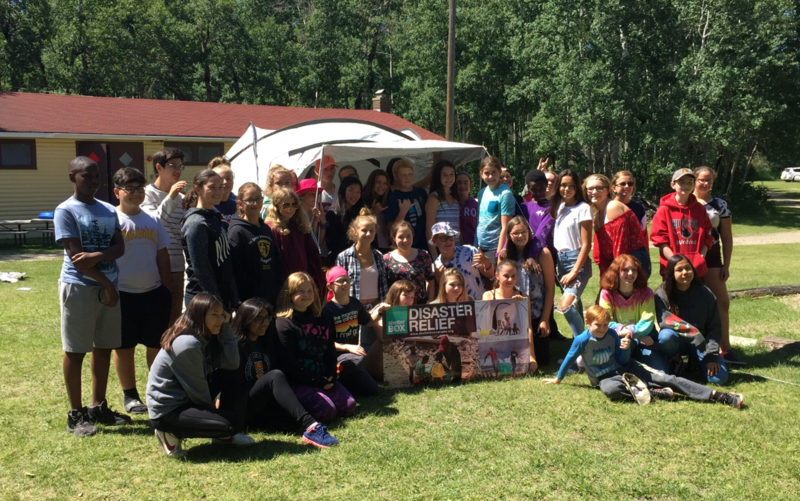 In our Rotary district (District 5550) RYLA camps are held in August each year in Riding Mountain National Park on the shores of Clear Lake at the Anglican Memorial Camp. RYLA Camp includes presentations, activities, and workshops covering a variety of topics. BASIC RYLA takes place over 4 days and participants must be 12, 13 or 14 yrs old. ADVANCED RYLA takes place over 5 days and participants must be 15, 16 or 17 yrs. old. Rotary District 5550 Governor Elaine Thompson visits the 2018 RYLA camp. RYLA participants are nominated by their local Rotary club. Applications are accepted by The Rotary Club of Brandon, in Spring each year. Camp fees and transportation costs are covered. We will transport you there and back. To find out more about the RYLA program and how to apply through the Rotary Club of Brandon, contact our Youth Leadership Coordinator. Organised by The Rotary Club of Ottawa the annual "Adventure in Citizenship" Program is where some 220 senior high school students, from across Canada, spend four days in Ottawa experiencing tours, lectures, discussions and social events designed to enhance your understanding and appreciation of Canadian citizenship. Through meetings with political leaders, senior officials and others, you learn a great deal about the workings of our democratic institutions. Through meeting one another and having discussions, you learn to appreciate the diversity of Canada and the privileges and responsibilities of Canadian citizenship. Student participants are nominated by their local Rotary club. Applications are accepted by The Rotary Club of Brandon, in February & March. Program fees, food and board and transportation costs to Ottawa are covered. 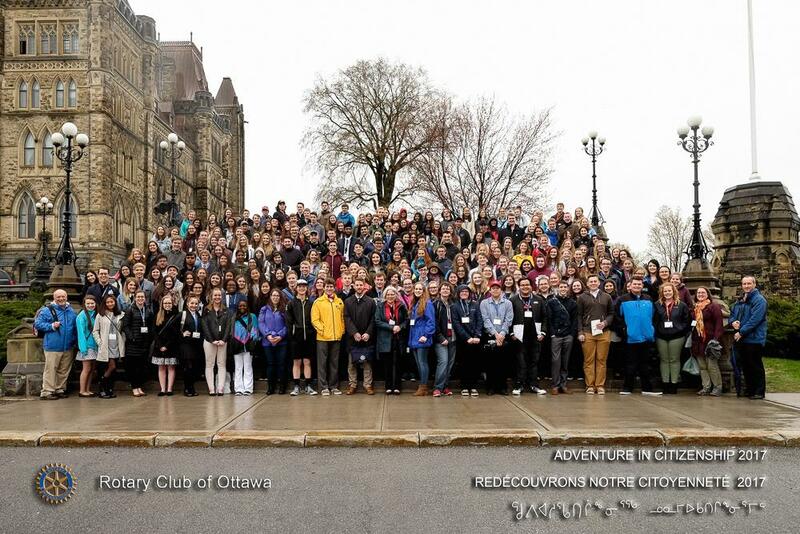 Students are billeted (homestay accommodation) with Rotarian families in Ottawa. There will always be two or more participants placed with each Host Family. We encourage students to be in contact with us as soon as possible as spaces go fast. For more information, contact our Youth Leadership Coordinator. This program, started in 1997, is held each November during the internationally acclaimed Canadian Western Agribition Livestock Show and Sale in Regina. Students visit Agribition; tour major agriculture-based industries; and, participate in networking and information sessions conducted by agriculture industry professionals and business leaders. The program is aimed towards senior High School students interested in agriculture and is designed to help broaden knowledge and understanding of the multi-faceted agricultural sector, environmental issues, and the challenge of providing food for the world. Applications will be considered from students in Grades 11 and 12 who are sponsored by a participating Rotary Club. Please contact our Youth Leadership Coordinator to find out more about Adventures in Agriculture and how to apply through the Rotary Club of Brandon. We encourage students to be in contact as soon as possible as spaces go fast. This is a one-week immersion program in human rights and is a collaborative effort of Rotary District 5550 World Peace Partners with the Canadian Museum for Human Rights (CMHR). The program provides you with an opportunity to explore human rights issues within the CMHR with visits also to various non-governmental organizations and other Winnipeg locations to see positive action, in human rights, in progress. Held each year, in August, high school students in grades 11 and 12 stay at the University of Winnipeg student residence under the supervision of Rotary members. Program fees, accommodation costs and transportation to Winnipeg are covered by the sponsoring Rotary Club. We encourage students to be in contact as soon as possible as places go fast. Please print the online application form, complete it and meet with the Youth Leadership Coordinator to discuss the application. MUNA was founded in April 1957 by the Rotary Club of Winnipeg, to introduce youth to the world of international politics, through participation in a simulated United Nations Assembly. Teams of two high school students, with an adult counsellor, form delegations to take on global citizenship as they model the United Nations Assembly. A delegation is assigned to represent a UN member country. The debates in MUNA, the committee structure, rules of procedure, and the general decorum of delegates, are designed to approximate the UN General Assembly, conditioned, of course, by local limitations. This program is held in May each year at the Canadian Mennonite University, Winnipeg, Manitoba. Rotary Clubs in partnership with a High School select a delegation of two Grades 9, 10, 11 or 12 students and an adult as counsellor. Further details can be found on the MUNA website. If you are a high school teacher or student interested in MUNA and want to find out more and how to apply for a sponsorship Please print the online application form, complete it and contact the Youth Leadership Coordinator to discuss the application. Through a Rotary International Youth Exchange, a student learns a new language, discovers another culture, and truly becomes a global citizen. Exchanges for students 15 to 19 years old are sponsored by Rotary clubs in more than 100 countries. Rotary Youth exchanges can be long-term (a year) or short-term (up to three months). At present our Club supports short-term exchanges through our Rotary District. It is a direct family-to-family cultural exchange that lasts usually seven weeks. During the exchange, you will live with a single host family, which will have a child also participating in the exchange. This exchange allows two families, from different countries, and often speaking different languages, to exchange and share with each other. Outbound Canadian students usually will spend the summer holidays (from early July until mid-August) participating in the program. The student’s family will host an inbound overseas student, usually in the same time period, though in some countries the inbound student will live in Canada in January and February. The students will be in both countries together for the duration of the exchange. Please print the online application form, complete it and meet with the Youth Leadership Coordinator to find out what opportunities are available, the costs and what the application process involves.